(B-Sides#1/2 (fb) ) - Shortly before they all graduated, Feeva was offered a place at the Pegasus Institute if she could motivate her friends Fateball, Jughandle and Mize into locating the mythical Nazi Sleeper of New Jersey. Doing so on the day of graduation, Fateball located the Sleeper's hiding place, in a camper in the woods; Mize accidentally destroyed both van and Sleeper. However the trio were angered to learn of Feeva's manipulations; though she gained her place at the Institute, she lost her friends. (B-Sides#1) - Charley Huckle sent invitations to Fateball, Jughandle and Mize to join the B-Sides, Raven's Perch's first super hero team. All three young superhumans met with Huckle the next evening at the Rama-Lama Bowling Lanes. After listening to Huckle's offer the trio discussed the offer and then agreed to Huckle's offer. To give them Huckle contacted a friend, who was posting bail bonds. (B-Sides#2 (fb) - BTS) - On the way to their next meeting with Huckle the B-Sides' car broke down due to Mize's powers. They arrived half an hour late to the meeting in a really bad neighborhood. (B-Sides#2) - Huckle showed the B-Sides their future HQ, the Jukebox, a desolate building in a bad neighborhood recently bought by Huckle for them. The B-Sides were not impressed. Huckle then showed them their costumes, actually bowling shirts provided by the Rama-Lama, who was "sponsoring" the B-Sides. Huckle then told the B-Sides that their first assigment was to be capturing Doctor Dark, one of Raven's Perch's own superheroes, who got into trouble with the authorities after injuring a man in a drunk barfight. Except for Jughandle none of the other B-Sides took the assigment seriously, angering Huckle, who still convinced them to catch Doctor Dark, who was in town (because he was after Huckle). 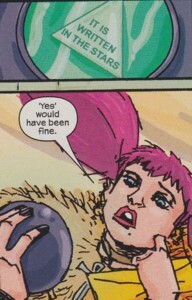 Fateball's sarcastic attempt to use her fateball to find Dark after Jughandle asked her if she could do that, surprisingly confirmed that Doctor Dark was at the Rama-Lama Bowling Lanes. The B-Sides took the bus to get to the Rama-Lama Bowling Lanes where they found Doctor Dark getting drunk. They bought some drinks to get near him, but when the bowling alley owner accidentally revealed that the B-Sides were friends of Huckle, when he asked them to deliver a message from the bail bond lady to Huckle about the Doc Ock case (the press mistook Dark for Doc Ock in the past and it stuck, which angered him as well), Doctor Dark attacked them. Jughandle safed himself and his teammates from Dark's first attack by jumping outside of time. Dark fled to the outisde where his epic battle with the B-Sides continued. Despite all their effort they only barely managed not to get beaten. The Fantastic Four's Invisible Woman caught Doctor Dark within a force field, saving the B-Sides, who were apprehended by her teammates. (B-Sides#3) - When the Fantastic Four were offered the bounty on Doctor Dark Huckle jumped in to negotiate how much of the bounty belonged to the B-Sides, who had tracked down and initiated the apprehension of Dark. Thing convinced Mr. Fantastic to give the bounty to the B-Sides because they were wearing bowling shirts as costumes and obviously needed the money. When the press arrived Huckle pushed Fateball in front of the camera to talk about how they had caught Doctor Dark along with the B-Sides. After the interview Mr. Fantastic told Jughandle that he was damaging the timestream by using his powers and that the damage would eventually cause problems for the whole world. The B-Sides reacted rather hostile at the Fantastic Four suggesting Jughandle wouldn't be allowed to use his powers anymore. Invisible Woman gave Jughandle a cocktail Reed had cooked up to fix his powers in a way that they wouldn't harm the timestream anymore, but Sue didn't tell the B-Sides. When the press informed the two teams that a man was holding two cats hostage at the Chip 'N Sip diner the Fantastic Four realized they were dealing with aliens the two teams joined forces to deal with the situation. While the Fantastic Four stopped the fighting between the local Kree and Skrulls the B-Sides got asked for help by Kree girl Leigh's Skrull boyfriend to save Leigh from his brethren. Fateball and Mize beat up the Skrulls attacking Leigh while Jughandle took her to safety outside of time. Jughandle then took Leigh to the diner took her mobile phone and called Leigh's father to convince him to let the Skrulls go. Leigh's father gave in. Mr. Fantastic tried to tell Jughandle that his powers had been fixed, but Jughandle flipped out and gave a big speech defending his right to use his powers. (B-Sides#3 - BTS) - While Jughandle gave his big speech to Mr. Fantastic with Fateball at his side Mize sat on the Fantastic Four's Fantasticar, damaging it using his powers. The Fantastic Four left Raven's Perch. (B-Sides#3) - Back at the Jukebox the B-Sides had beer and pizza with Huckle. Jughandle was sad that he wasn't allowed to use his powers anymore because for the first time in his life he knew he wanted to be a super hero. He got in Mize's face because he didn't stand at his side when Jughandle gave his speech to Mr. Fantastic. Mize then revealed that he had damaged the Fantasticar with his powers during Jughandle's speech, surprising his teammates and Huckle, who couldn't believe Mize could do something that stupid to known heroes. (B-Sides#3 - BTS) - The Fantasticar broke down at the Jersey Turnpike. They sent Huma Torch to get their other Fantasticar to pick them up. Thing got his hands on Raven's Perch's newspaper and saw an article on them and the B-Sides, claiming the B-Sides had helped them twice in one day to apprehend Doc Ock and save rare Siamese cats. Angered by Mize's actions Susan asked Reed to send the letter explaning to Jughandle how Reed's cocktail had fixed Jughandle's powers second class only. (All-New Official Handbook of the Marvel Universe A-Z#2 - B-Sides) - The B-Sides continued their heroic adventures. (Civil War: Battle Damage Report#1 - BTS) - Tony Stark considered the B-Sides' Fateball a potential Initiative recruit. Comments: Created by Evan Dorkin (character designs), Brian David-Marshall (writer) & Brett Weldele (artist). Mize called the B-Sides the "Bad News Bears" of super heroes in B-Sides#2. This is a reference to 1970s comedy about a Little League team comprised of some of the most unathletic children possible. They were trained by drunk ex-minor-league player Morris Buttermaker played by the late Walter Matthau. The movie had two sequels. 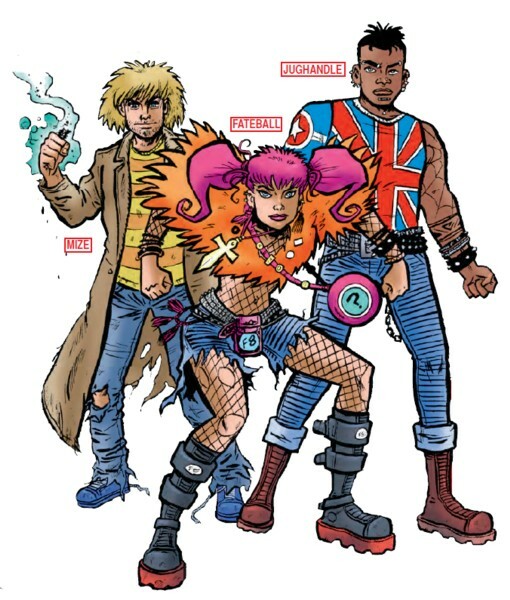 The B-Sides received a profile in All-New Official Handbook of the Marvel Universe A-Z#2 (April, 2006), which was later updated with the awesome main image used in this profile among other things in All-New Official Handbook of the Marvel Universe A to Z Premiere HC#2 (June, 2006). Fateball (Laura Broadbahr) was very athletic and a capable brawler. She was in possession of a toy fateball, which could correctly divine the future, though it often answered very sarcastically. (B-Sides#1 (fb) - BTS) - Laura took gymnastics for a year in high school, played soccer for six months and learned martial arts from movies at the Music Palace in Chinatown. At some point in third grade during recess she learned from Dawn Dorio how to defend herself easily against male attackers....just go after the "family jewels". (B-Sides#1/2 (fb) - BTS) - Near the end of her high school career Fateball used her power to confirm for her friend Feeva the existence of the mythical Nazi Sleeper of North Jersey. (B-Sides#1/2 (fb) ) - After their last day at high school Feeva took Fateball, Jughandle and Mize out for the night. Feeva motivated them to help search for North Jersey's Nazi Sleeper. When one of Feeva's cameras saw a creature she referred to as a Piney, she and her friends followed it through the woods to a trailer. There they got surrounded by a horde of Pineys. Fateball fought some of them, but they all fled when Mize's powers caused the trailer's refrigeration unit to blow up. With the refrigeration unit ruined the Bio-sleeper stored inside awakened, but only for a moment because Mize destroyed it as well. After learning that Feeva had manipulated them only to get accepted at the Pegasus Institute Fateball and the others got angry at her. Fateball left before Feeva could multi-task an excuse. Feeva's former friends left her behind in the woods. (B-Sides#1 (fb) - BTS) - Laura received an invitation from Charley Huckle, but she didn't open the envelope to read it. (B-Sides#1) - Laura went to the Heights in Raven's Perch to tell rich Valeria Silvermane to stay away from her good friend Jesse Metuchen. 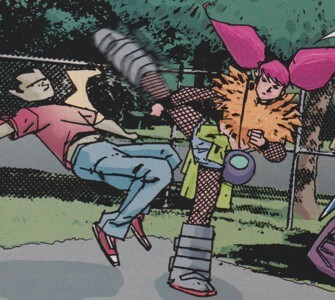 Silvermane sent her bodyguards to get rid of Fateball, but the young brawler knocked out both of her bodyguards and her driver before going after Silvermane again. Threatening to cut out her heart Fateball convinced Silvermane to stay away from Jesse. Fateball fate ball confirmed Silvermane was telling the truth. Shortly after on a park bench Laura opened the invitation and read it. She went to the meeting at the Rama-Lama Bowling Lanes along with her superhuman friends Mize and Jughandle. All three were surprised the invitation came from local conman Charley Huckle. After hearing Huckle out Mize suggested to discuss the offer in one of Jughandle's loops outside of the timestream. Convinced by Mize, who told them they had nothing else to do anyway, they took the offer from Huckle to become Raven's Perch's first super hero team. Afterward Huckle told them he knew a woman, who was posting bonds for meta-humans, and call her to see if she had a job for them. (B-Sides#2 (fb) - BTS) - The B-Sides' car broke down due to Mize's powers and they had to walk the rest of the way to meet with Charley Huckle again. (B-Sides#2) - Fateball told Charley why they were late. Huckley showed them their future HQ the Jukebox and saw a rat running out, commenting that not even rats wanted to live in this house. Upon entering she wasn't surprised at all by the desolate building. When Huckley told the B-Sides about the costumes, actually bowling shirts, he had bought for them, Fateball told him that she was already wearing a costume. She took her shirt and bound it around her waste. Huckley told the team their first case would be catching Doctor Dark. Fateball and Mize made fun of Jughandle vast superhuman trivia knowledge and angered Huckley because they didn't take the job seriously. They took the job and when Jughandle asked her if she could help find Dark she sarcastically asked her fateball if Dark was at the bowling alley and to everybody's surprise the fateball confirmed it. After a bus ride they found Doctor Dark drinking at the Rama-Lama Bowling Lanes. They bought some drinks and had a conversation with Dark, learning he had been friends with Huckle in the past. When the bowling alley's owner revealed that the B-Sides were friends with Huckle, Dark flipped out and attacked them. Jughandle took Fateball and Mize into a loop outside of the timestream to escape Dark's first assault. The team then took the fight with Dark to the back alley, but despite a good dropkick from Fateball, they nearly lost against the inept villain. The Fantastic Four arrived and Invisible Woman trapped Doctor Dark in a force field while Thing got hold of Fateball to apprehend her. (B-Sides#3) - While the police arrested Dark and Mr. Fantastic picked up the bounty on him the B-Sides stayed in the background. Huckle tried his best to get the bounty for the B-Sides and ultimately gained it when the Thing convinced Mr. Fantastic to just give the money to the B-Sides because the young superhumans were wearing bowling shirts as costumes and obviously needed the money. When the press arrived for an interview with the Fantastic Four Huckle pushed Thing out of the way and Fateball in front of the camera to talk about how the B-Sides had helped the Fantastic Four capturing Doctor Dark. Still a bit angry at Huckle for not telling them that Dark was after Huckle, Fateball still gave the interview. After the interview Fateball listened to Mr. Fantastic explaining to Jughandle that his powers were damaging the timestream. Sue gave Jughandle a cocktail Reed had cooked up to fix Jughandle's powers, but she didn't tell him. Fateball defended Jughandle's right to use his powers and asked her ball if Jughandle's powers would destroy space and time by using his powers. Her ball shrugged. The local press told both teams about a man holding two cats hostage at the Chip 'N Sip diner and both teams went there. While the FF took care of the aliens the B-Sides were asked by a Skrull boy to save his Kree girflriend Leigh from his brethren. Fateball kicked some Skrulls around along with her teammates to save Leigh. Jughandle then called Leigh's father with Leigh's mobile phone and convinced him to let the Skrulls transformed into cats go. Fateball was impressed that Jughandle was using his powers despite Mr. Fantastic telling him not to. Later at the Jukebox Fateball had beers and pizza with her friends. When Mize revealed that he had damaged the FF's Fantasticar with his powers she was a bit shocked. (B-Sides#3 - BTS) - The press reported about the B-Sides aiding the Fantastic Four in apprehending "Doc Ock" and saving rare Siamese cats. Jughandle was able to move himself and others into a temporary loop outside of the timestream. (B-Sides#1/2 (fb) ) - After their last day at high school Feeva took Fateball, Jughandle and Mize out for the night and Jughandle picked up a weighted street barrier during the drive to North Jersey. Feeva motivated her friends to aid in the search for North Jersey's mythical Nazi Sleeper. They followed a creature referred to by Feeva as a Piney when one of her cameras picked it up. The quartet followed the Piney through the woods to a trailer where they got surrounded by a horde of Pineys. Jughandle tricked two Pineys to tackle each other when he retreated into a loop outside of time. The Pineys fled when Mize's powers caused the trailer's refrigeration unit to blow up, releasing Bio-sleeper stored inside the trailer, but only for a moment because Mize destroyed the Sleeper as well. After learning that Feeva had manipulated them only to get accepted at the Pegasus Institute Jughandle and the others got angry at her. Jughandle wondered if Feeva would try to motivate them into being happy for them, then left with the others, leaving Feeva behind in the woods. (B-Sides#1 (fb) - BTS) - Valeria Silvermane was in a relationship with Jughandle, but she kept hurting his feelings. (B-Sides#1 - BTS) - Fateball approached Valeria and violently convinced her to stay away from Jughandle. (B-Sides#1) - Jesse hid in a loop outside the timestream to spy on the Kree girl Leigh and her Skrull boyfriend making out in Leigh's home on Main Street. When Leigh's father caught them he started beating up the Skrull boy and even threatened to hit his daughter Leigh, but Jesse interfered, giving Leigh and her boyfriend time to run off. Leigh's father recognized Jughandle, as the mayor's son. Back home Jughandle listened to his father talking to Leigh's father, who had called Jesse's dad, mayor of Raven's Perch. Jesse's dad afterward reminded Jesse that it wasn't easy to be an African-American mayor. 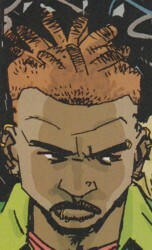 Jesse tried to defend his actions because he saved the girl and boy from her father, who would've murdered them, but in the opinion of Jesse's father it would've been preferable to Jesse being found in a 16-year-old girls room spying on her by using super powers because he couldn't afford a scandal. Jesse left and shortly after read an invitation e-mail from Charley Huckle to join a local team of super heroes. Jesse and the others met Huckle at the Rama-Lama Bowling Lanes. Jesse tried to call Valeria, who seemed to try avoiding him. (Fateball's fault). They listened to Huckle's offer and Jughandle remembered that Huckle was the guy selling solar-powered clothes dryer for $ 9.95. After a quick laugh Jesse took himself and his friends into a loop outside the timestream when Mize suggested to discuss Huckle's offer. (B-Sides#1 - BTS) - Jesse's use of his powers activated an alert at Four Freedoms Plaza Reed Richards had built. Thing was unable to shut it off and knocked on Reed's bedroom door. Reed shut it off and told Thing it could wait until morning. (B-Sides#1) - Mize surprised Jughandle and Fateball when he suggested to take the offer because they had nothing else to do anyway. 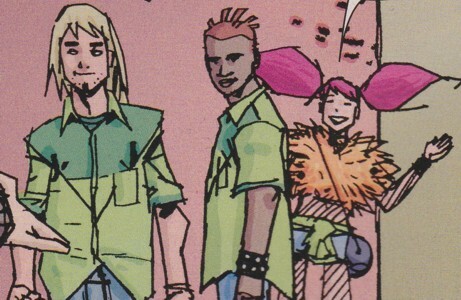 Jughandle returned them to regular time and concinved by Mize they took Huckle's offer to become Raven's Perch's first super hero team the B-Sides. Afterward Huckle told them he knew a woman, who was posting bonds for meta-humans, and call her to see if she had a job for them. (B-Sides#2) - When the B-Sides arrived late and Charley told them he had to get to work, Jughandle was surprised because he thought Charley only worked in the evening. Charley revealed he was also selling Time Life books by phone during the day. He then showed the B-Sides the Jukebox, a desolate building, supposed to become their future HQ. Jughandle liked the idea to move into the Jukebox because he preferred it to living with his parents. He happily took the bowling shirt offered as costume by Charley then learned of the B-Sides' first bounty hunter assigment: Capturing Doctor Dark. Fateball and Mize tricked Jughandle into revealing all he knew about Doctor Dark, to make fun of his superhuman trivia knowledge, which angered Huckley because they didn't take the job seriously. Though Jughandle was a bit miffed at his friend he took the job along with the others. Jughandle asked if Fateball could use her fateball to show them where Dark was and after sarcastically asking the fateball if Dark was at the bowling alley, the team learned from the fateball that he actually was. Jughandle took Dark's photograph with him and after a bus ride arrived with the team at the Rama-Lama Bowling Lanes. He spotted Doctor Dark getting drunk and the B-Sides bought some drinks to get into a conversation with Dark. They learned Dark had been friends with Huckle in the past, but was now after him because he blamed if for all that went wrong in his life. Dark attacked them when the alley's owner revealed that the B-Sides were friends with Huckle. Jughandle took Fateball and Mize into a temporary loop to escape Dark's first assault. The team then took the fight with Dark to the back alley, but despite teamporarily pulling Dark into a time loop, they nearly lost against the inept villain. The Fantastic Four arrived to talk with Jughandle and Invisible Woman trapped Doctor Dark in a force field while the Human Torch took Jughandle out of the fight, by blocking him with a stream of fire from engaging Dark again. (B-Sides#3) - After the police had arrested Doctor Dark Mr. Fantastic was offered the bounty on Dark's head, but Huckle tried his best to get at least some of the money for the B-Sides, who stayed in the background during this. Ultimately Thing convinced Reed to give the whole bounty to the B-Sides because they wore bowling shirts as costumes and obviously needed the money. After Fateball's interview Mr. Fantastic explained to Jughandle that his powers were damaging the timestream and Jughandle would have to stop using his powers if nothing was done. Sue gave Jughandle a cocktail Reed had cooked up to fix Jughandle's powers, but she didn't tell him the cocktail would fix the problem. The local press told both teams about a man holding two cats hostage at the Chip 'N Sip diner. Jughandle surmised the cats were actually shapeshifters and both teams went there to deal with the situation. While the FF took care of the aliens the B-Sides were asked by a Skrull boy to save his Kree girflriend Leigh from his brethren. Jughandle took Leigh to safety in the timestream and took her to the diner. Fearing the fighting between the Skrulls and Kree in Raven's Perch could turn into an intergalactic incident Mr. Fantastic tried to talk to Jughandle when he returned to the diner with Leigh, but Jughandle told Mr. Fantastic he didn't need his advice and went into a loop outside the timestream with Leigh's mobile phone to call her father inside the diner and convinced him into releasing the Skrulls in cat form he had caught. Outside the diner Mr. Fantastic tried to talk to Jughandle again, but Jughandle went off on him, telling Mr. Fantastic that he had no plans to stop using his powers for the good even if it meant Mr. Fantastic classified him as a villain. Unable to get a shot at explaining that his cocktail had fixed Jughandle's power and there was no reason to not use them Mr. Fantastic and his team left Raven's Perch in the Fantasticar. Later at the Jukebox Jughandle had beers and pizza with his friends and confronted Mize about not being at his side when he gave his big speech to Mr. Fantastic. When Mize revealed that he had damaged the FF's Fantasticar while Jughandle gave his speech, with his powers Jughandle was surprised. Mize could accelerate the decay and breakdown of nearby items. Under stress he lost control over his powers, often destroying objects he didn't want to. (B-Sides#1/2 (fb) ) - After their last day at high school Feeva took Fateball, Jughandle and Mize out for the night though Mize wasn't into the adventure at all and rather wanted to party at the Rock. Feeva angrily stopped him from leaving and motivated him and the others to aid in the search for North Jersey's Nazi Sleeper. Using her flying cameras Feeva saw a creature she referred to as a Piney and the four friends followed the Piney through the woods to a trailer where they got surrounded by a horde of Pineys. Mize used his powers to fight the Pineys by decaying a tree trunk. The tree nearly squashed a few Pineys. The Pineys fled when Mize's powers destroyed the trailer's refrigeration unit, freeing the Sleeper stored inside. Feeva motivated Mize to use his powers to break open the trailer's door, which could only be opened from the inside. Mize used his powers with explosive effect to open the door. Inside they found the awakening Sleeper. Mize freaked out, lost control over his powers and destroyed the trailer and the Sleeper. After learning that Feeva had manipulated them only to get accepted at the Pegasus Institute Mize got angry and left with Fateball and Jughandle, leaving Feeva behind in the woods. (B-Sides#1) - At Raven's Perch High Mize comforted cheerleader Eliza, who had trouble with her quarterback boyfriend Banks. Mize told her how hard it had to be for her boyfriend losing all season and got really close to her. Moments later Banks tossed a football through Mize's car's front window, blaming him for his team's losing streak because he knew about Mize's powers from Feeva. 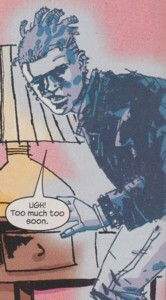 Mize lost control over his powers when Banks threatened him, blowing up a hydrant by accident and ruining his own coat. One part hit Eliza in the head and Mize apologized, calling it an accident before fleeing to his car. Banks ran after him, but his harmstring caused him problems again, giving Mize a chance to escape the angry football players in his car. Back home at Raven's Perch Consigment and Antiques Store Mize switched coats. His parents were screaming at him as always and Mize quickly left again, finding an invitation from Charley Huckle for a new local super hero team stuck under his car's wiper. Mize and the others went to the Rama-Lama Bowling Lanes where Fateball suggested to call Feeva about the invitation. Mize was still angry and Feeva and totally against it. They then met with Huckle and listened to his offer. Mize made fun of the B-Sides name and added "Craptacular" to the team name. Mize told the others they needed to go somewhere to talk this over and Jughandle took his friends into a temporary loop. Inside the loop Mize told his friends they should take Huckle's offer because they had nothing else to do and the guy offering them this opportunity was the same guy, who managed to sell two nails and a string for $ 9.95. Back in the real world Mize told Huckle they would like to be the "Craptacular" B-Sides and Huckle told them he would get them their first job as bounty hunters through a friend of his, who was posting bonds for superhumans. (B-Sides#2) - When the B-Sides arrived late to the meeting with Huckle Mize immediately pointed out how crappy the neighborhood was. Only moments later Huckle showed the B-Sides a desolate building he had bought as the B-Sides' future HQ known as the Jukebox. Inside the Jukebox Huckle gave the B-Sides their costumes, actually bowling shirts. Mize put his own because it didn't matter what they were wearing because their team would be the "Bad News Bears" (see comments) of super heroes anyway. Huckle then gave them info on their first case as bounty hunters, capturing former Raven's Perch hero Doctor Dark. Mize and Fateball made fun of Jughandle's superhuman trivia knowledge and Huckle flipped out because they didn't take the case seriously. They still took the case and after Fateball's fateball told them where Dark was the B-Sides headed to the Rama-Lama Bowling Lanes by bus where they found Dark drinking. Mize had an idea to get to him by having a drink with Dark. While drinking with the former hero they learned he had been friends with Huckle, who he blamed for his miserable life. When the alley owner accidentally revealed that the B-Sides were colleagues of Huckle, Dark assaulted them. Jughandle protected his teammates by pulling them into a temporary loop. Afterward they followed Dark to the back alley where Mize used his powers to destroy a fire escape staircase Dark was laying on though it fell on Mize resulting in Dark gaining the upper hand against the B-Sides. The Fantastic Four arrived and Invisible Woman trapped Dark in a force field, saving the B-Sides, while Mize was pulled out from under the staircase by Mr. Fantastic. After Fateball's interview Mize destroyed a device Mr. Fantastic was using to analyze Jughandle's powers. He listened as Mr. Fantastic explained how Jughandle's powers were damaging the timestream. Sue gave Jughandle a cocktail Reed had cooked up to fix Jughandle's powers, but she didn't tell him the cocktail would fix the problem. The local press told both teams about a man holding two cats hostage at the Chip 'N Sip diner. 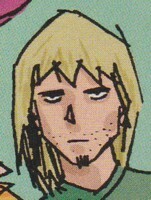 Mize joined the B-Sides on the misison and they were asked by Leigh's Skrull boyfriend to save her from his brethren. Mize used his powers to break open the ground beneath two Skrulls. Back at the diner Mize sat on the Fantastic Four's Fantasticar, secretly damaging it, while Jughandle held a speech about his right to use his powers to Mr. Fantastic, who shortly after left Raven's Perch with his team on their Fantasticar. Later at the Jukebox Mize had beers and pizza with his friends and when Jughandle confronted Mize why he didn't stay behind him during his speech Mize revealed that he had secretly used his decaying powers on the Fantasticar, shocking his teammates and Huckle. (B-Sides#3 - BTS) - The press reported about the B-Sides aiding the Fantastic Four in apprehending "Doc Ock" and saving rare Siamese cats. The Fantasticar broke down at the Jersey Turnpike due to what Mize did. (B-Sides#2 (fb) - BTS) - Charley Huckle bought a desolate building in one of the worst parts of Raven's Perch, New Jersey and planned to turn it into his super hero team's headquarter known as the Jukebox. (B-Sides#2) - Huckle introduced the B-Sides to their future HQ and told them they could move in to one of the three apartments. (B-Sides#3) - The B-Sides returned to the Jukebox and had some beers and pizza with Huckle after aiding the Fantastic Four against Doctor Dark and in a complicated situation with extraterrestrial Kree and Skrulls.